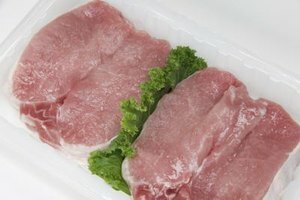 Boneless pork chops are enhanced by crunchy coatings. 4 Can I Coat Chicken Wings in Cornstarch Before Deep-Frying? 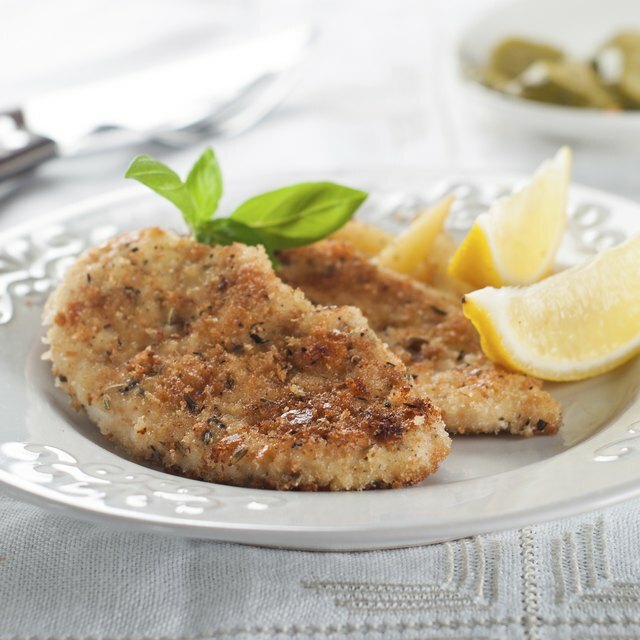 Whatever your goal, boneless Parmesan-crusted pork chops fall right into step. They are simple to prepare, which is a good thing, especially on those days when you’re pressed for time and you can still foster the impression that you fussed endlessly in the kitchen. The result is the irresistible combination of a moist, juicy chop with the crunchy sensation of bread crumbs, heightened by the smooth presence of Parmesan cheese. Make your Parmesan crust coating with a mixture of grated Parmesan cheese and bread crumbs. Use your favorite store-bought variety or make your own by tearing Asiago cheese, or French or Italian bread into pieces, and then running them through a food processor until the crumbs reach the size you desire. Alternatively, use salty or cheesy crackers or cereal flakes to create the crumbs. Sprinkle the mixture with thyme or oregano, if you desire. Set up your coating station so that your pork chop dinner comes together in a jiffy. In one dish, mix flour, salt and pepper. In a second dish, stir several eggs and some milk or melt some butter. Put the Parmesan crust crumbs in a third dish. Preheat your oven to 425 degrees Fahrenheit. Line a baking sheet with aluminum foil. Set a cooling rack sprayed with nonfat cooking spray on top of the sheet so that the chops get crispy on the bottom. Dip a chop in flour, then in the milk or butter mixture. Place the chop in the third bowl, coating it thoroughly on both sides with the Parmesan crumbs. Place the chop on the rack and put the baking sheet in the oven. Bake the chops for about 25 minutes or until they reach an internal temperature of 145 F when you insert an instant-read thermometer in the thickest part of the chop. Let the chops rest for three to five minutes before serving, according to Food Safety.gov. Serve your pork chops with garlic mashed potatoes enhanced with fresh Parmesan cheese. If you can't see the world, then you may as well try to meet (or at least talk to) everyone in it. So goes the hopeful thinking of many journalists, including Mary Wroblewski. This is why you'll see her work in a wide variety of publications, especially those in the business, education, health care and nutrition genres. Mary came of age as a reporter and editor in some of Chicago's scrappiest newsrooms but softened up long enough to write nine children's books as well as one nonfiction tome.